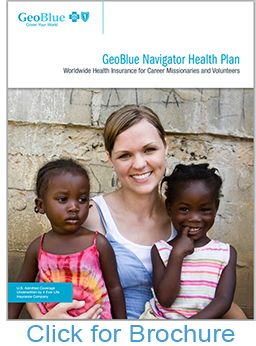 Worldwide health insurance and services for career missionaries and volunteers - The GeoBlue Navigator health plan meets the needs of missionaries and volunteers by offering comprehensive worldwide benefits - inside and outside the U.S. - without the typical limits, eligibility conditions and benefits exclusions common among traditional plans. Unlike plans that limit furlough coverage, GeoBlue Navigator covers stateside tours, delivering the continuity and convenience of benefits that are truly seamless and portable. GeoBlue Navigator is the premier health plan for missionaries and volunteers because it combines these benefits with concierge-level medical assistance and easy access to an elite community of carefully selected hospitals outside the U.S. and a network of over 700,000 doctors and hospitals inside the U.S. through the Blue Cross and Blue Shield Network. GeoBlue Navigator gives missionaries and volunteers peace of mind, knowing they always have the freedom to access top medical care and benefits no matter where their ministries take them. The GeoBlue Navigator plans will go through a rate increase effective 07/01/2016. For this increase it is a flat 3% across all age bands and deductible options. This is good news as this increase seems to be well below National and International trends. 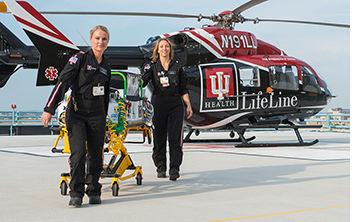 Access to Universal Rx - a national provider of managed care prescription services. GeoBlue Navigator offers comprehensive benefits and a range of deductible options that allow members to select the right amount if insurance coverage for their budget and lifestyle. For families, the deductible and coinsurance maximum is a multiple of 2.5. After 364 days of continuous coverage, Navigator members may re-enroll in a plan that matches their existing befits. GeoBlue Navigator offers four deductible plan choices, $250, $1,000, $2,500 and $5,000. It is important to note that your deductilbe is reduced to half when you received medical services outside the United States. For Example: a $1,000 Deductible Option is $500 outside the U.S.